I’m sitting here tonight thinking on the knitting I haven’t gotten to yet this week, and wondering just how much progress I can make on my sock before I need to write up and publish my blog. Maeve chooses this moment to take advantage of my open lap and hops in for a snuggle. Maeve loves snuggles. Briannag has been bugging from the couch for snuggles every time I cursed the book quiz I need to finish before the regularly scheduled class time next week. It has been a week of ups and downs, the ups were not always enough to compensate the downs, but only if I dwell on each day separately. I do not have class so early next Wednesday that I need to change my sleep schedule from overnights to days; however, we also miss out on a review, and the instructor is providing a book based exam. I have cursed anything book based in the entire class. It’s often confusing at best. However, I’m focusing more on the ups, and listening to Bon Jovi’s song “Have a Nice Day” as I contemplate my week. The biggest up was dinner with my oldest niece at Bob Evans-nothing fancy, but she’d never been there. Part of our goal is to go places she’s never been. We’re considering finding the best burger served at each place we dine at and are keeping a commemorative journal of our dinners. She even told me she wants to be a food critic when she grows up, amongst her twelve other jobs she may or may not be able to accomplish via freelance work. It was a great dinner. (Phones were not present at this event, except to make a quick note to pick up a journal, which we did). Photos were not taken either. In the meantime, how far do you think I can get? I promise to get photos too. 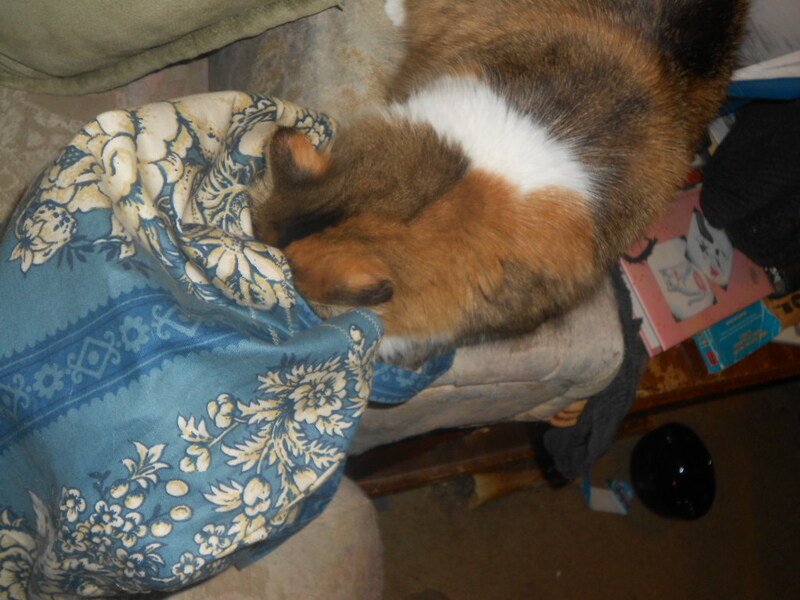 Now, I retrieved my knitting bag from its home in the chair, where it is tied shut to keep curious kittens out of it. This is a requirement, as you’ll notice Scamp immediately made a nose-dive into the bag when I set it on the edge of the couch and placed my pillow in its proper back-supporting position. Once I snapped the photograph and shooed Scamp out of the knitting bag, I began cursing at the sixteen dropped stitches I needed to pick up. Diligently, and patiently, I slipped them back on the needle one at a time. I resisted the urge to overwork the knitting using two needles. Some days, I feel I’ve become quite good at returning stitches to their rightful needles so that I may continue my work. 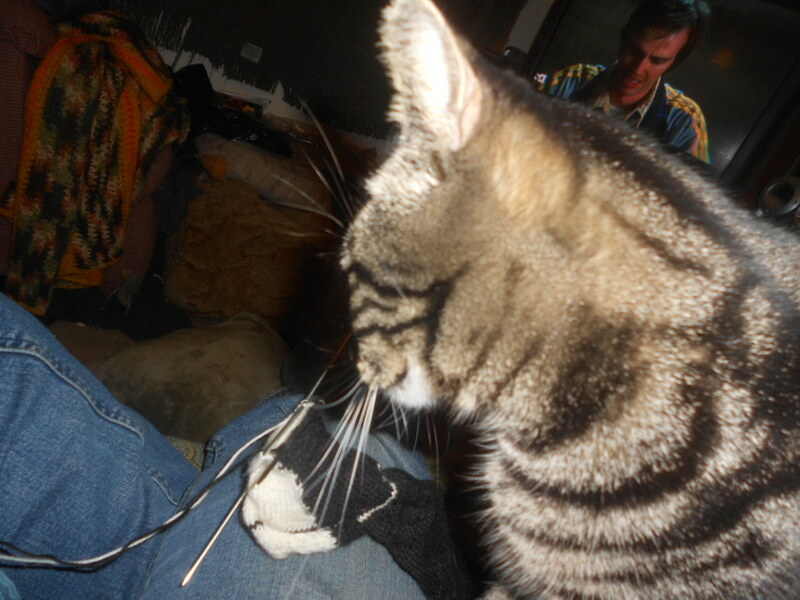 Then I set about the business of knitting, and does long fibrous strands moving across needles create an interesting diversion for the most discernible curious creature. The couch suddenly became full of furry felines, wondering if mom would let them play with some of the yarn she only gets out on those special days. Then I continued to knit and purl and created uneven eyelets to connect the two socks, and decreased the one extra stitch I’d managed to pick up, likely before I dropped the sixteen cream colored stitches. The extra stitch was on the black yarn side of things. However, I knit away, and while I hoped to get two inches of progress in, I think I got closer to one and a half. I didn’t measure before I started though, so I can’t be certain. We can only guess if I have room for before and after shots, or if you are so inclined to check last weeks blog. In the meantime, while I won’t be finishing this sock in the next week, I will be diligently continuing to knit it. I’m hoping it provides some sanity in the cursing of the book exam. Its said to be open book, but I have experience with this book, open book is as much of a curse as closed book with poor wording. Alas, I have made progress with the sock, and I had a great time at dinner with my niece. Those will be my focal points this week. After all, once you get past the periscope, its all simply perspective. For the rest of it, I’ll enjoy a glass of wine and take the semi-immortal Bon Jovi words of the world getting in my face to heart and say “Have a nice day!” I sometimes wonder if they substitute other words for nice. Has two meanings…writing poetry when you might be knitting is one of them.Avoiding knitting mistakes, so you don’t have to work out cabling errors is another. I may have fallen into both categories this week. So, I began knitting to avoid necessary homework…I should know better. I don’t. I’m not sure any of us really know better, even when we should. 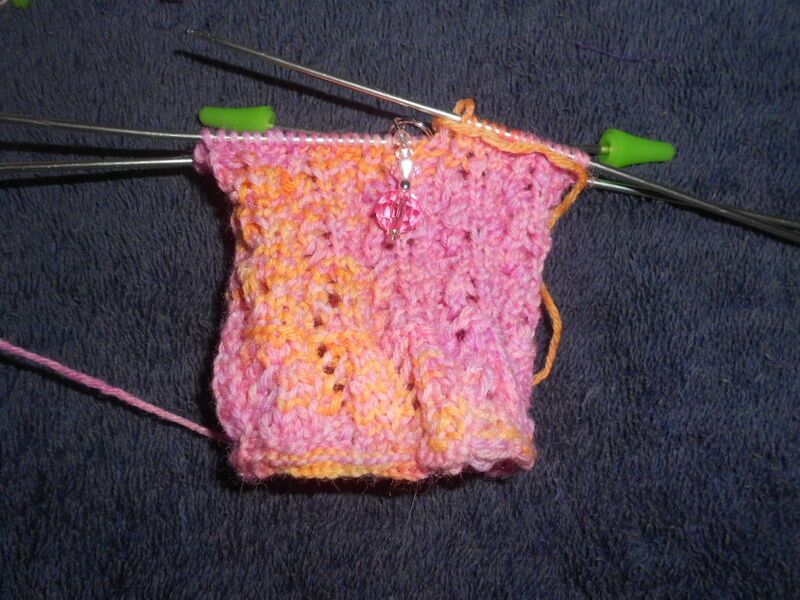 I missed a purl stitch in the pattern…so I began procrastinating the fix. However, I finally took time to fix it. Tomorrow’s break knitting in Middle School (Spanish and Art), should be fun, provided it’s not first or second hour and they ask me to work for someone else. However, I’m now smart enough to say extra work. (Yes, partly because it’s hard to say, “No.”). In the meantime, this row is fixed and finished while watch Project Runway re-runs (and I thought Project Runway was over). Alas, I have to read for classes and catch another play–the hardship! I want to know how it ends, which is a good sign for A Raisin in the Sun, partly because I may know how Macbeth ends already (even if I don’t remember it–part of me doesn’t care). In the meantime, here’s the procrasti-knitting. Tink, helping me show off my knitting. I’ve gotten a few more rows done this week, and part of me cannot wait until school is out to finish this sock and it’s mate. I did revisit some socks I finished last semester. I still need to weave in ends and tie off holes. Shh…I’ll get to them…just not on this gentle Thursday. I did inspect them again and try them on my feet. The heels fit funny. I may have to re-knit my stealth argyles…I may sew them as blister protector cushions. Who knows. Back view…shh…I’m fixing the ladders. In the meantime, I did get a little knitting done as I waited for events and class to start this week, and on break while substitute teaching. Yeah. I did have to judge if I had time to start the next row. I didn’t. I ended up starting that next row while waiting for a fun poetry reading. The poet had done well at Slam Poetry previously. Her performance style showed. It was a good reading, and here’s my current progress. Front view of this complicated sock. It’s a fun knit, but it requires concentration. I might be doing vanilla socks for my next pair. Our new trouble-maker…Furball (for now). I promised last week to set aside some time each day to knit this heel. I did, but not the time I expected. Instead, Sunday night, we had a new addition in the form of an energetic two-year old Chow-chow mix. Apparently, she’s mixed with cat (yes, I’m jesting, I think). She does not come when she’s called, which we will work on She’s nervous in the car when she runs out of the house, which we will work on. And she refuses to eat canned food, which we will let slide. We’re out of our element here. The top half of this sock…part of me can’t wait until this heel is turned. 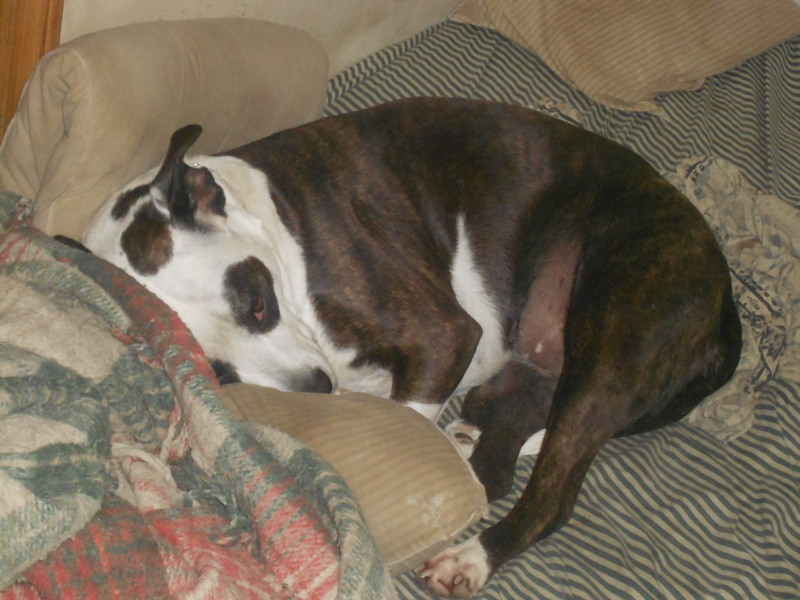 We’re used to bigger, lazier dogs, that are dogs, and are food motivated. Or we’re used to dogs who act like you’re asking too much when you scoot her off of your favorite couch pillow. She’s cat-like, in that she only wants your attention when you ignore her or are trying to get things done. (and she will not come back when she’s called–in part this is a two-year old dog. In part this is big pain in the arse.) So, she was named Fireball when we got her, and we’re in the process of changing it to simply Furball. After her latest trek out of the house to romp around the neighborhood for nearly an hour at a balmy 21 degrees F (at least it isn’t 9 degrees today), you can replace Fur with your favorite choice phrase. Mine just might start with an S.
Speaking of that Big S. Here’s Scamp…who also goes by the nick name for Furball sometimes, tonight, she’s behaving (or pretending to). So, Tuesday night, after two days of introduction, I had brought my knitting over, and sat on dear James couch knitting, or trying to. I remember why I knit alone. Every time I tried to make a stitch, I had a dog start to snuggle me and place her large paw on my arm so that I essentially could not knit. I did get her maneuvered and accomplished some knitting, but I’m not certain how much. The heel looks a little better from the back. It doesn’t help that I don’t think I love this heel pattern. I don’t love doing any heels toe-up, and I like this method less than most. There seems to be a lot of unnecessary yarn-overing, unless one has very large heels. My heels tend to run small, and I am not paying for any heel pattern. So, the search is on, and here come small heels in the back stretch…I’ll let you know as I knit which ones I might like…or I will move to doing each and every pattern cuff down with an eye of partridge heel flap (then decide on how to turn it). Until next week, happy knitting and may your dog be better behaved than our new addition. (p.s. She will not stay still for photos, either, again…cat-like). However, the cat has decided she will simply snuggle me for now, since I’ve been “neglecting” her lately. (Really, she’s been sleeping when I’ve headed home, but that’s severe neglect in the cat world). In the meantime, hopefully I’ll get the heel turned this weekend and the dog adventures will settle down for a bit. Serious neglect, I’m telling you. 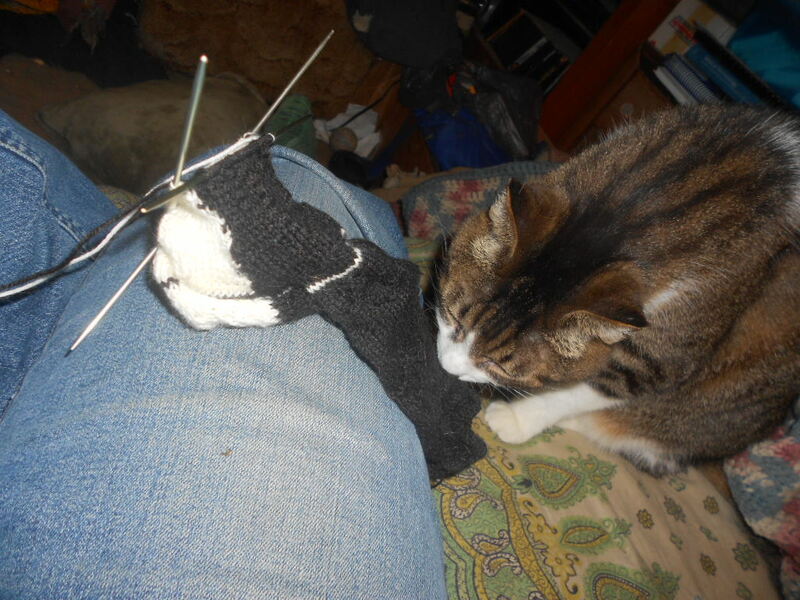 Scamp needs some loving…never mind my knitting goals. Three Skeins in, seven to go…onward to the fourth. I have finally knit through the third skein of yarn. I had to count the remaining hanks of yarn to be certain. It’s simple, I can watch my favorite tv shows while I knit this. It’s also growing. I should measure it tonight to track how far I’ll go with hanks four and five. I have ten skeins of yarn to use in this. I’m debating about stopping after four and decreasing with four more skeins and making something matching or some border details in this, but I haven’t decided where exactly I might go with this. Can you believe it? 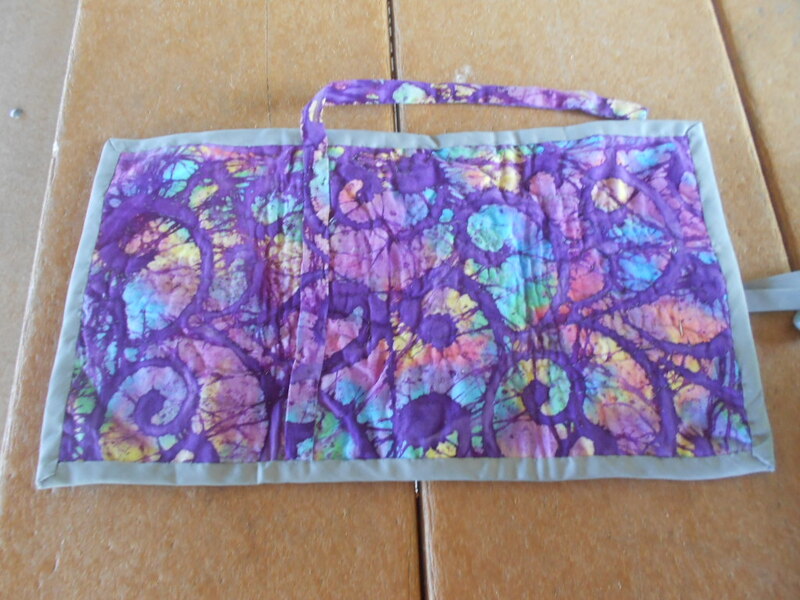 I’ll try to get a spread photo on my sewing table over the weekend…I’ve got a wing;-). I’ve also knit through the second repeat of the first sock and have moved onto the third. I should be able to knit the heel over spring break if I’m good. However, I have a fair amount of school work to do, and I may be seeking further gainful employment. It has been a challenge, but I should be more gainfully employed next week. Fingers crossed. But you guys would rather see the sock, right? 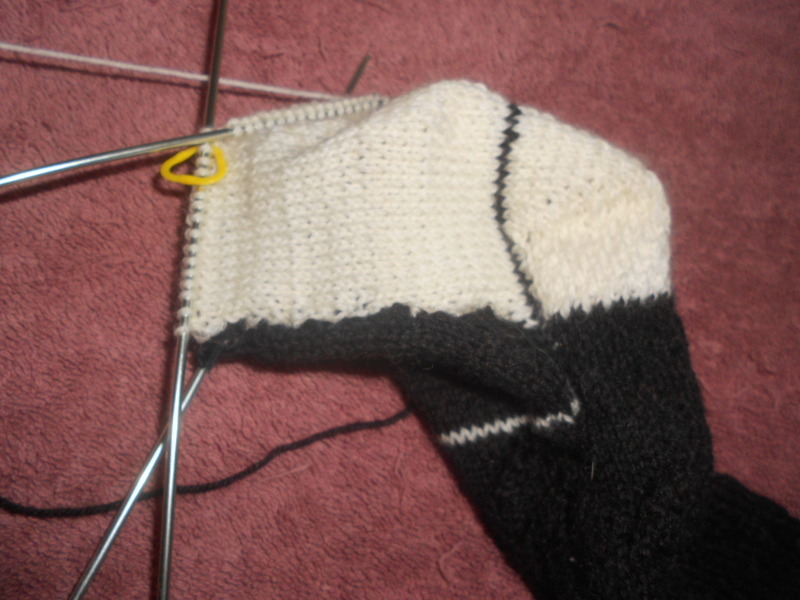 Progress on the sock, Two repeats of the chart down…one more to get to the heel. Enjoy your gratuitous knitting photos. I hope yours goes as well or better (one day, I’ll learn not to knit when tired, but that explanation may be for next week). Until next time, Happy Knitting! Some of these patterns are just too mind-boggling for the tired brain. Alas, I’m loving this sock… it is never boring. Then the rest of my week happened. 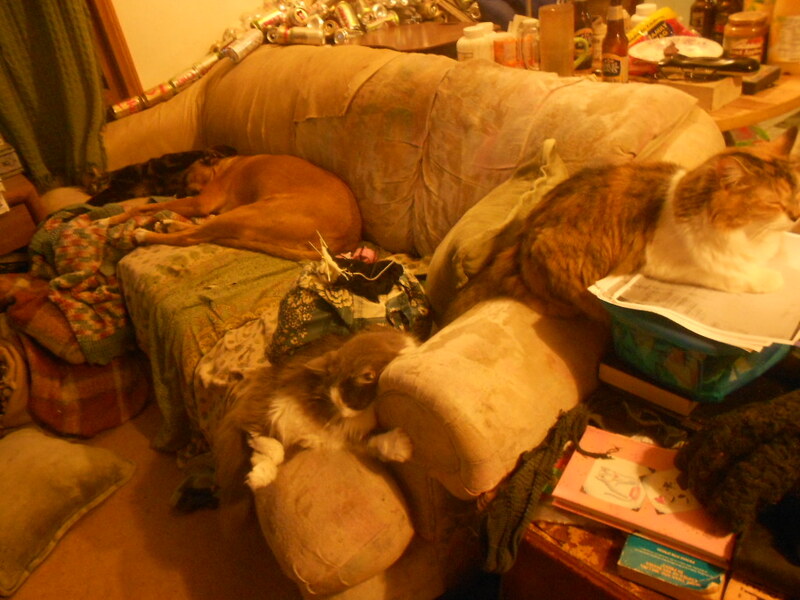 For a moment, we had an affordable vet bill, and a reprieve for our dear Zeusy. But liver problems prove a difficult foe, and he still wasn’t eating after 24-36 hours on the pill, so my dear James gave up his best friend this week. Zeus will be missed, but he’s playing in that great big dog park in the sky, and dear James’ dad is probably throwing all the balls the dog wants (or that dog park in the sky has automatic ball and squirrel launchers that look and smell like your human. I mean, who knows what kind of heaven a dog gets, but it involves throwing the ball. Trust me. 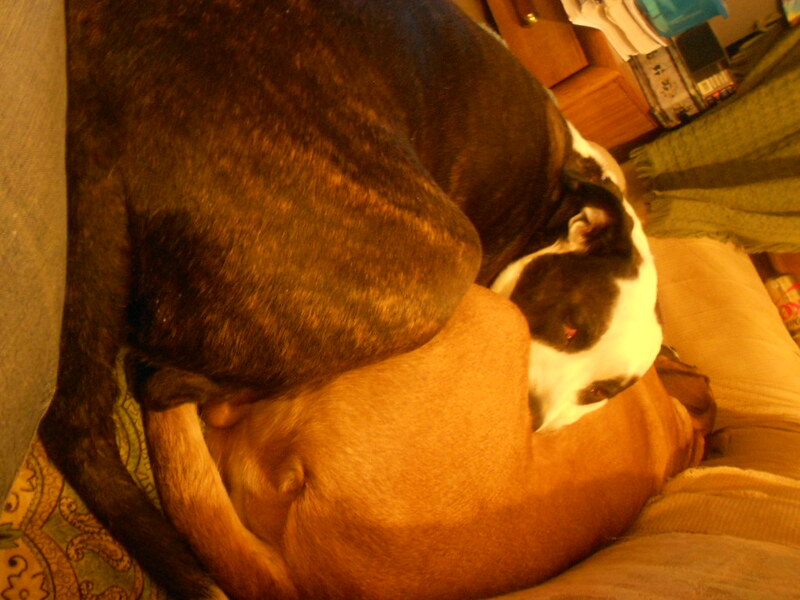 Zeusy and Maeve…two of our best snugglers… They are both missed. Later in the week, I got a couple of rows done, when I wasn’t busy making up for snow days (doing far more work than I would have in class, but I’m glad they kept us safe). Then I came home to knit on the shawl for a bit tonight, and am almost finished with the third skein of yarn…In the next row or two (or four), I will be researching joins and joining yarn for the next skein. I’m getting closer to the turning point…I may or may not just continue through the fifth skein…I might knit a border instead. We shall see. The in-progress shawl… that shall bring us spring…I hope. I realize you do wish for me to knit faster. Explains my last week. This week, nothing got done as everything was closed. So, I caught up on homework, Graduate School Applications, small personal matters, and quilting. However, last week, when I got busier than busy (as everyone thinks I have a spare hour, really), I found two things happening. Let’s revisit Tuesday first. I took my shawl to quilt guild. It’s simple knitting, and the weather was only bad, not horrible. So I got to chat with Jan, who was presenting and had a great trunk show. But others noticed my “mindless” knitting. The knitting is mindless in that I can knit while chatting with others. 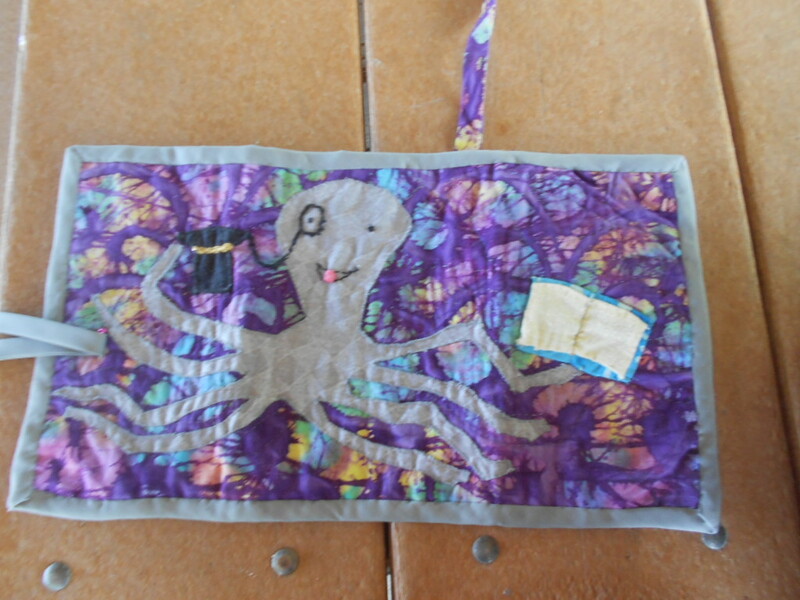 So, this is what ‘even stitching’ looks like. I never gave it a thought…in fact, I wish I’d followed the pattern more closely. One of my fellow quilters (and likely knitters) commented on my even stitching. (I never gave it any thought, it is pretty even, isn’t it?). Alas, that’s just the shawl, in which I admit I have no idea what I’m doing. Also, Thursday of last week, I was waiting for an appointment, and took my socks. I was working on them when an 8-10 year old boy asked about them. I think he’d been grounded from his phone and he forgot a book or toy. His buddy wasn’t there yet, so my complicated socks happened to be the most interesting thing in the room. I was happy to explain the stitches as I waited for my own appointment. The latest on the complicated socks…we’ll see what happens between now and next week (hopefully). Here’s the progress, so far. (Classes have been mostly cancelled this week, so knitting has been light, but here’s the current progress).